Got Five Minutes? Bake Bread! It’s been seven years since I became a bread maker. I read a book, gave it a try and found immediate success. A year later, I wrote this follow-up I can’t really take much credit for this thing I love so much–turning out amazing loaves of bread on a whim. I owe any success I have achieved to Jeff and Zoe–creators and authors of Artisan Bread in Five Minutes a Day. Here’s the routine: Once every other week I dump basic ingredients into a big square plastic container that has a lid, and fits nicely into my refrigerator. I stir it up, set the lid in place and walk away. That takes 15 minutes at the most. Two hours later (or when I remember), I set the container in the refrigerator. Done. 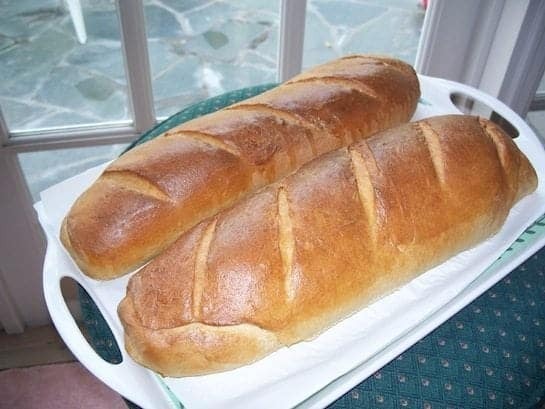 Homemade loaves of bread using the 5-Minute Artisan Bread method. 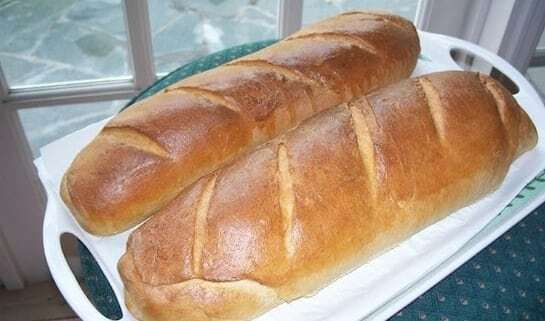 Whenever I want a loaf of bread (like every morning), I reach into the container, pull off a wad of dough, shape it, let it rest while I take a shower, then pop it into a hot oven. In about 25 minutes, there it is: a beautiful, rustic, amazing loaf of bread–the kind I would expect to see in the finest French bakery. Truly, I spend no more than five minutes per day, overall, doing this. And the cost? Less than 50 cents a loaf. Have you priced good bread in the supermarket lately? I’m seeing $4 and more per loaf! Jeff Hertzberg and Zoë François are quite a team. Jeff is a physician, scientist and aspiring baker. Zoe is a pastry chef and baker who trained at the Culinary Institute of America. They met at their kids’ music class. Together they have created and developed a fabulous no-knead way to make awesome bread, and now run the Bread in 5 empire, boasting of what I’m guessing to be millions of followers. Me: Why a new edition of Bread in 5? J&Z: When we released our first book in 2007, we didn’t have our website and blog in place (BreadIn5.com). So we wrote that book without the benefit for input from our readers (OK, they didn’t exist yet…). Over the years, readers have asked us for new material, and told us about all the ways that things could be even easier. Me: What have you learned since the original in edition (2007?) that those of us who’ve used that book all these years should know? Are these changes now reflected in the new edition? J&Z: One of the most important things we learned was that most home bakers love the visual cues you get from cookbooks that have lots of color photos. Our website is loaded with photos and video (click here for a sample recipe). So we lobbied our publisher for more of those—and they came through, with 40 gorgeous new color photos, and over 100 black-and-white. Our first book had just eight color shots, and 20 black-and-white. There are about thirty brand-new recipes, including beer-cheese bread, crock-pot bread, panini, pretzel buns, and more. Our readers expressed preferences, like lower salt versions, more whole grain options, and even some gluten-free recipes. And they wanted all of it to fit into their budgets–so the ingredients for our recipes cost about forty or fifty cents for a one-pound loaf (seventy cents for gluten-free). Me: There’s a big move toward gluten-free in this country. In fact, my husband is convinced and hardly will touch regular bread these days. Is it really possible to make gluten-free Bread in 5? J&Z: Absolutely. The recipe to try first is on our website (click to view). There are a few more ingredients, but the method is exactly the same–mix once, bake many, storing the extra dough in the fridge. J&Z: We only used ingredients that we could find in our local supermarket, though you can also get these flours online. Me: When will you reveal the topic of your next book? We are We are quite curious! J&Z: Our next book is Gluten-Free Bread in Five Minutes a Day, and it’s available for pre-order here. We are very, very excited about this book. https://www.everydaycheapskate.com/wp-content/uploads/042514.jpg 409 545 Mary Hunt https://www.everydaycheapskate.com/wp-content/uploads/EverydayCheapskateNewLogo.jpg Mary Hunt2014-04-24 23:00:402018-01-28 23:23:05Got Five Minutes? Bake Bread!